The Citizens Theatre in Glasgow, in collaboration with the National Theatre of Scotland, are currently performing a new trilogy of plays by Zinnie Harris, This Restless House, based on the 2500 year old works by Aeschylus, The Oresteia. Before seeing the new plays I went back to look over Aeschylus' work, which for me brings back happy memories of my times visiting and working in Greece. On every trip to Greece I love to tick off ancient sites and the scenes of great dramas and myths. The Oresteia at the time it was first performed was commenting on real events in the Athenian courts of the day, as well as talking about kings, cities and gods that would be known to all in the audience. I have been lucky enough to visit many of the settings from The Oresteia, so before a brief review of This Restless House I have used this as an excuse write about beautiful, wonderful Greece. Ελλάδα, σ'αγαπώ. 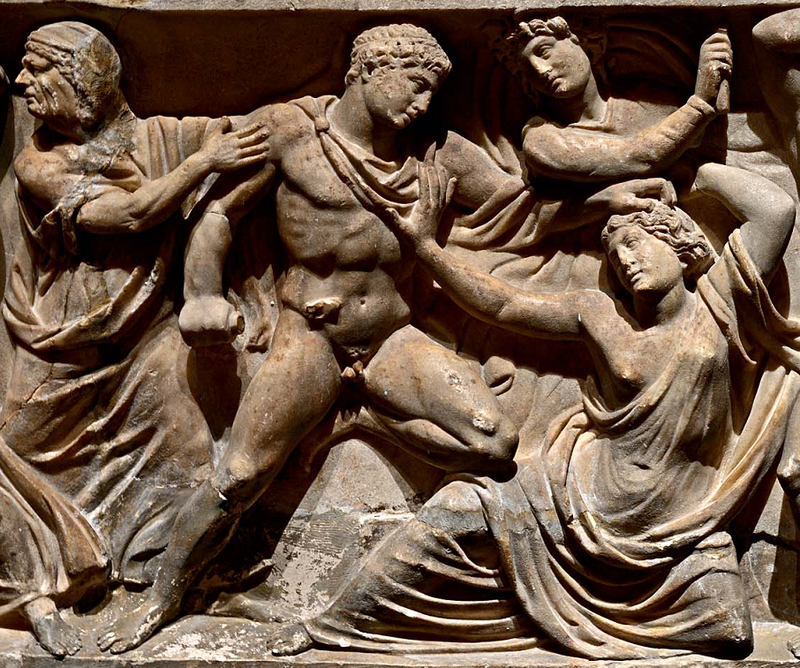 The origins of Western drama lie in Ancient Greece. 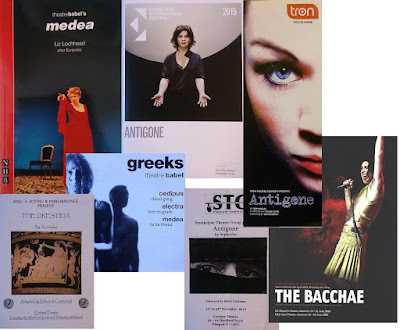 Two and a half millenia ago festivals and competitions of drama were taking place and although only a small fraction of these plays have survived to this day, those that have are being endlessly performed, re-imagined and re-told. The oldest surviving intact drama is often thought of as Aeschylus' historical tragedy The Persians. 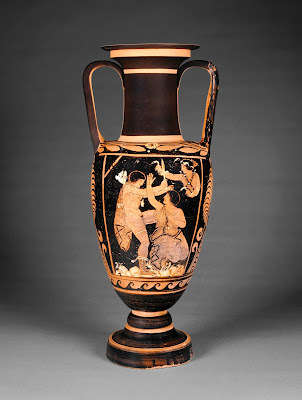 It won a prize at the Dionysian festival at the foot of the Acropolis in 472BCE. By this time its creator had already been writing for 25 years. Only six of Aeschylus' 80-odd plays survive to this day (seven if Prometheus Bound is credited to him). He was in his sixties when he wrote The Oresteia trilogy of connected plays, telling the bloody story of Mycenaean King Agamemnon and his family. The three plays of The Oresteia are named after Orestes, son of Agamemnon. They tell the story of a family fated by the bloody history of their ancestors to continue a cycle of violence and revenge. Through the centuries since it was written people have tried to unpick the additions and accretions of subsequent transcriptions, to get back to the 2500 year old original. In 1847 Wagner spoke of the effect it had had on him. It is said that his Ring Cycle was inspired by The Oresteia. George Eliot's character Adam Bede used to sit and read The Oresteia over breakfast and often quoted from it. The oldest book we have in our house is a beautiful 1843 edition of Aeschylus' works, perhaps the edition that Adam Bede was reading. Aeschylus himself was born near Athens in about 545BCE. Although we know him as a writer of tragedies, his epitaph in Ancient Greece spoke only of his valour in the Battle of Marathon, fighting against the Persians in 490BCE, a battle in which his brother was killed. Ten years later he was alive at the time of the Spartan defeat at Thermopylae to Xerxes. He died around the age of 67 whilst in Syracuse in Sicily. It is reputed that he was killed when an eagle dropped a tortoise upon his head, mistaking it for a rock to crack open the shell. A tragic death so bizarre you suspect it may be true. The Oresteia trilogy of plays were first performed in 458 BCE. They start with a cycle of bloodshed and revenge and end with the world deciding whether it should instead move on from that and accept justice, and the rule of law. After ten years away King Agamemnon returns to Mycenae, in the Northern Peloponnese, fresh from victory in the Trojan War. He has with him Cassandra, daughter of King Priam of Troy. Before sailing he obeys the gods' command to sacrifice his daughter, Iphigenia, in order to allow his ships to sail to Troy. With Agamemnon away his wife, Clytemnestra, is in an adulterous relationship with Aegisthus, cousin of Agamemnon. He believes the throne is rightfully his, after Agamemnon's father, Atreus, killed the brother of Aegisthus and fed him to their father Thyestes. The bloody acts of the past ensure that bloody retribution will follow in the future. For refusing his advances at the opening of a temple in Corinth, Cassandra, a princess and prophetess, has been cursed by Apollo with the ability to tell the future, but that nobody will believe her prophecies. The original Cassandra complex. The first play ends with Clytemnestra avenging their daughter Iphigenia, swinging her axe and killing her husband Agamemnon, and also Cassandra. She and Aegisthus become rulers of all Argos. Archaeologist Heinrich Schliemann saw the events in ancient literature as a guidebook to the Greek world he excavated. In uncovering the city of Mycenae he found several grand tombs and from the contents within declared that he had found the tombs of Cassandra and of Agamemnon. The second play opens at the tomb of Agamemnon, The Libation Bearers. The daughter of Agamemnon and Clytemnestra, Electra, is discussing revenge with her brother Orestes. Electra convinces him to adopt a disguise and get into the royal palace. There he kills Aegisthus. He falters at the thought of killing his mother, until egged on by the god Apollo. Ridden by guilt he flees, pursued by the Furies (Eumenides), a curse from his mother in female form. The third play opens in the shrine of Apollo at Delphi where Orestes has fled the Furies. The oracle commands he travels to Athens and stand trial. The goddess Athena organises proceedings there, with a jury of citizens, Apollo as his advocate and the Furies as his accusers. With the jury divided Athena casts the deciding vote in favour of Orestes. The Furies threaten to turn their ire on the city of Athens itself, until Athena placates them with the promise of a place for Athenians to worship them in the city. The cycle of revenge and bloodshed is ended with the rule of law and justice by the state. This final act is set at the Areopagus, the rocky site of a court in the time of Aeschylus. This is just at the foot of the Acropolis. Later the Areopagus was where Paul stood to deliver a famous sermon in Athens. It also gave its name to a prose polemical by Milton in 1644, Areopagitica, opposing censorship and arguing for freedom of speech. The original music, dance and spectacle of Greek theatre is lost to us, but the stories live on. We have to re-imagine how the chorus and performers interacted with the story and the audience. The vase below shows a Greek performance of The Libation Bearers, the scene where Orestes is about to slay Clytemnestra, and she exposes her breast that once suckled him saying "Hold, oh child, and have shame." Again and again characters are presented with moral dilemmas where right and wrong are ambiguous. Despite being commanded to act by Apollo, can he kill his own mother? In the background a Fury is already rising, snakes held in her hands. 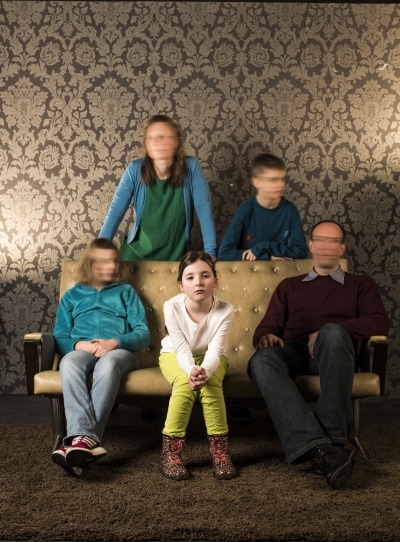 I really like the photograph used by the Citizens Theatre to advertise the trilogy of plays they have produced, This Restless House, based upon the Oresteia. 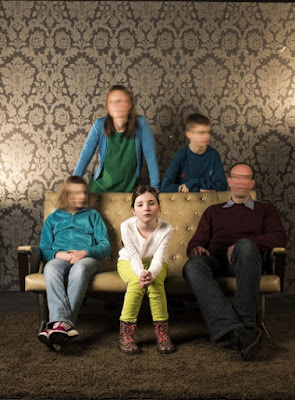 A family is in turmoil, a blur of movement, apart from the steady gaze of a young daughter at the centre. This is how Zinnie Harris reframes the story, by putting at the centre of it Electra, daughter of Agamemnon and Clytemnestra. The three plays, put on over two performances, have been put in a contemporary setting, with the original place and characters put there. The delicate balancing act of using modern vernacular (and swearing) whilst still giving the characters gravitas works right from the off when we are introduced to the chorus. Three drunken vagrants, witnesses to everything, but largely unseen, with their impotent gnashing of teeth. Part One, called Agamemnon's Return, opens in what resembles a shabby 1970s working men's club. After the brutal murder of her daughter by Agamemnon, Clytemnestra enters like a drunken cabaret singer, bitter and damaged. When Agamemnon returns from war, the ghost of Iphigenia is always present between them. The fetid atmosphere is built up by the dystonic musical score by Nikola Kojabashia. 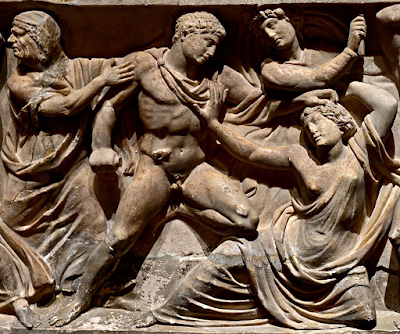 In Aeschylus' day the violence happens off stage, but here when Clytemnestra stabs the unarmed Agamemnon in his bath he runs naked onto the stage where Clytemnestra finishes butchering him, and unable to escape her fate, kills Cassandra in the process. With female characters the focus of this story, the fates of Iphigenia, Clytemnestra and Electra are now bound together. Part Two, The Bough Breaks, sees Electra trying to banish the ghost of her father who she feels is tormenting her mother, Clytemnestra. Pouring libations of wine and vodka onto Agamemnon's tomb she meets her brother Orestes who feels damned to avenge his father. Like an unscratchable itch he cannot get this thought from his mind, sleepless and trying to drown it with alcohol he feels powerless to alter his destiny. Putting the female characters to the fore, Electra is the one bold enough to avenge her father when the time comes, Clytemnestra now a shadow of herself, knowing she is fated to eternal damnation. In Part Three, called Electra and her Shadow, the setting has shifted, and it feels like a bit of a clunking gear change, as we move from a world of Ancient Greeks in contemporary garb, to the very real world of a modern psychiatry ward. Electra ended the second act in a seizure and is tormented by demons. Feeling powerless to control them or escape them her psychiatrist tries to show her that she is not a puppet to fate. The empathetic psychiatrist has to confront her own demons and the final scenes give us a version Aeschylus' divided jurors. With ghosts getting to be heard at the end the last scene packs a powerful punch that left me with a tear in the corner of my eye. The acting, was excellent throughout, grueling in places. Particular mention must go to Pauline Knowles as Clytemnestra, George Anton as a brooding Agamemnon, Olivia Morgan as Electra and Lorn MacDonald as a twitchy Orestes and a gangly chorus member. The third part almost stands as a separate play in tone and message, but together the plays are a powerful re-imagining of the words and ideas from Aeschylus. The characters feel that they are doomed by events to follow a certain path, and powerless to change things. Their impotence is self-imposed and they need to be shown to take responsibility for their own actions. Maybe it is just because of the type of people that I work with that I saw a link in all this with those that feel incapable of tackling an addiction such as alcoholism. Drinkers may feel it is an inevitable response to earlier events, drowning out their demons, and then later their headaches, itches, shakes, nightmares and seizures. When drunk, are you still responsible for the actions you take? In the plays alcohol swills about repeatedly, from louche cabaret singers, to drunk drivers and alcoholic fathers having vodka poured onto their graves. Many characters display textbook symptoms of alcoholism and a powerlessness to change their ways. Is drink now our contemporary god and demons? Well, it has been around for a while, hasn't it? The festivals of Dionysus, where the plays of Aeschylus were first performed, the driving force of Greek theatre, were festivals to the god of wine making and a frenzy of excess. Anyway, I'll raise a glass to a powerful re-telling of some meaty stories.